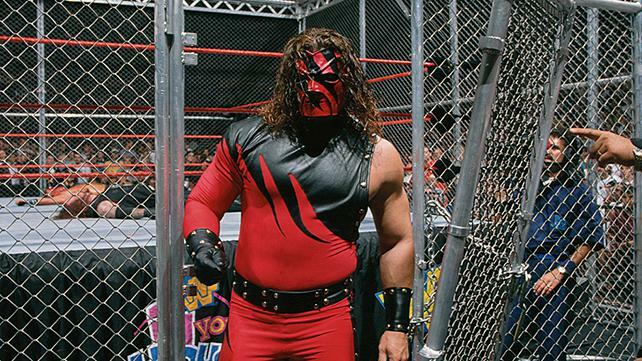 Through hellfire and brimstone, Kane made his explosive WWE debut at Badd Blood: In Your House in 1997, attacking his brother The Undertaker during the first-ever Hell in a Cell Match pitting The Phenom against Shawn Michaels. With that bold statement — which included tearing the door off the Cell itself — The Big Red Monster set the tone for his destructive WWE career. Seeking retribution against Undertaker, who allegedly started a funeral home fire that left him physically and psychologically scarred, Kane would go on to lash out against the entire WWE roster. The unhinged psyche of The Devil’s Favorite Demon made him an immediate challenger for WWE’s most elite titles. In a memorable First Blood Match with “Stone Cold” Steve Austin at King of the Ring 1998, Kane captured his first-ever WWE Title. The WWE Universe would soon learn Kane was far more than a demented monster, however, as Kane found allies in D-Generation X. The Big Red Monster struck up a bizarre kinship with the degenerate X-Pac, and the duo went on to win the World Tag Team Titles twice. Kane’s other bizarre and humorous Attitude Era team-ups included an alliance with the massive Rikishi, the super heroic Hurricane, the high-flying Rob Van Dam and even his estranged brother.